John Skelton is probably best known to American audiences from his work with The House Band, with whom he has recorded 5 albums on the Green Linnet label. He has also released a solo album, One at a Time, on Pan Records, Holland’s leading acoustic music label. John has performed at all the major folk festivals in North America and Europe and has given concerts in over 20 countries. 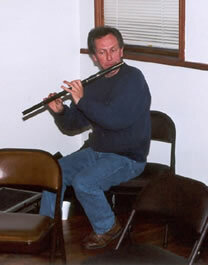 He is also an experienced flute teacher and has taught at summer schools in North America, Europe, and Africa. John’s roots lie in Irish traditional music. His grandfather and great-grandfather were flute and tin whistle players. He was born in London and returned there to live during the seventies. This was a “golden period” for Irish music in London. Bobby Casey, Roger Sherlock, Raymond Roland, Danny Meehan and many others were out playing and it was in this “hothouse” of great music that John spent his formative years. He first began to play professionally with the Irish band Shegui, and for six years he toured throughout Europe with them. That band included pianist/fiddler John Coakley (later of The Boys of the Lough), fiddler Tommy MacCarthy (now a leading light in Boston’s Irish scene), and singer Sean Keane (brother of the great Irish singer Dolores Keane). He joined The House Band in 1987 and since then has been a central figure in that band’s success. He has toured the world with them, and on stage, his marvelous introductions and stories of life on the road have become central to their concerts, with one American newspaper gong as far as to refer to him as “the English Garrison Keillor!” He is, however, better known as an accomplished and distinctive flute player. Alongside his background in Irish music, John also has a wealth of knowledge of the music of Brittany. He spends much time there and is a highly regarded player of the bombarde (the traditional oboe-like instrument from Brittany). He was recently described as “the finest bombarde player outside of Brittany” by NPR’s Thistle and Shamrock radio show. John also plays the “piston” (low bombarde) and the “veuze” (the bagpipe of Eastern Brittany). Q: That’s quite a collection of flutes and whistles you have (in the photo on your CD)! Which flute(s) do you find yourself playing most often, and why? A: I play two flutes almost exclusively. They’re both eight keyed and were both made in London by Hawkes, one is in concert pitch and the other’s in F. The concert flute is a mid nineteenth century ‘Hawkes First Class’ and is made of rose wood. The F is a “Hawkes Sonorous” model and is made of ebonite. The concert pitch flute has been my flute for 20 years now, it’s a great flute and I know it inside out … that’s why I play it . Playing the F is a kind of relaxation; it isn’t as hard to fill and has a lovely hard edge, it allows me to ‘let rip’ and get an ‘older’ sound. Take no notice of the photo on the CD! Over the years I’ve acquired a lot of instruments both as gifts and from out of the way junk shops (one of the perks of being ‘on the road’). I don’t really play them very much, it was just a humorous idea for a photo. Q: The whistles you play on the CD have a nice, strong tone (both the standard whistles and the low ones). Who made them? A:The D Low Whistle was made by Brian Howard in England. I also play an Overton now and again. It all depends on the tune. I find that the Howard seems to suit the slower more ‘wistful’ tunes, whereas the Overton has a bit more bite to it. All the other whistles are straightforward ‘Generation’ ones. They’re older whistles on the whole (I tend to hang on to the same whistle for ever!) interestingly, the older ‘Generation” whistles seem to be better made. They’re heavier and the mouthpieces are better finished. Q: You were inspired to pick up the flute by the playing of Mikey Cronin (fiddler Paddy Cronin’s brother). Can you describe his style for us? A: Earthy. Rhythmic. Raspy tone. What we used to call in London, “dirty playing.” The nearest as I can remember (it was 25 years ago) would be like the style associated with Seamus MacMathuna and Conal O’Grada. I first heard him in Ballydesmond which is in the heart of Sliabh Luachra. Not an area for flutes and I don’t think that he had a particularly local repertoire, but he was a hearty player. (As an aside, if anyone reading this can point me in the direction of any recordings of Mikey Cronin, I would be very grateful – my few bits and pieces have long since disappeared). Q: Roger Sherlock and Cathal McConnell have also been big influences for you. What attracted you to their playing? A: Roger Sherlock was the main flute player in London when I first lived there. I wouldn’t claim that I try to play like him, it’s just that his effortless playing was always a joy to listen to, and hearing him twice a week for 3 or 4 years must have had its effect. To me, Cathal McConnell is the epitome of a great flute player. When I hear him play, what I hear is “listen to this, this is a great tune” not “listen to me, I’m a great player”. Of course he IS a great player, but it’s all very subtle. Being frank, I’d have to say that he’s a player who is best appreciated by ‘grown ups.’ Maybe some of the more ‘pyrotechnical’ players impress the general public with their technique, but I find after a short while that their tunes all start to sound the same. Not so with Cathal. He’s passing on the music, not using it to impress. Of course there’s also that wonderful tone, and the slow air playing (where it’s obvious that he’s a singer). Q: As someone who teaches flute, can you give a few helpful tips to beginners, and perhaps a few words of advice to more experienced players? A:The way that you practice is often overlooked and is important to get sorted out. a) Find a nice quiet room with good acoustics if possible. Arrange to be ‘incommunicado’ for the practice period. b) keep a learning tape with the tunes that you are working on. Record the tunes that you want to learn several times back to back, that way, you don’t have to keep going back to the beginning of the track. Needless to say – learn by ear. c) start each session off by playing over the last tune (in it’s entirety) that you have just learned. Set yourself a goal for each session : perhaps the turn of a tune or a nice variation you just heard. Concentrate on that, don’t just play about. d) learn the WHOLE Tune. Don’t tell yourself that you have the tune when there are still phrases or bits that are still a little hazy. Once you have all the notes in their right places then the Rhythm will fall into place. It’s better to know 10 tunes inside out, than 100 tunes ‘fairly well’. e) Don’t give up! It all works out eventually. If you’ve made it this far through all the pseudo “Celtic” dross, and have come to appreciate good traditional playing, then you’ll probably be listening and playing for many years to come. So …. you’ve loads of time to build up that repertoire and achieve the sound. AND …. You can’t learn a tune until you know it. (I know that sounds odd). If you find a tune you want to learn, don’t come to it cold, listen to it over and over for days … in the car, doing the dishes, whatever. By that time you’ll be able to hum it (or most of it) and then it’s fairly easy to transfer that to the flute. For the more experienced players: work on achieving your own sound, so that your playing is recognisable and you’re not just another clone. I suggest that you listen to Jean-Michel Veillon from Brittany. I consider him to be THE leading simple system player today. Totally recognisable, all rhythm and highly innovative. Of course, not everything he does necessarily fits within the framework of Irish playing, but he will certainly make you think about your own playing. Q: The Road to Buggleskelly, a reel you wrote and recorded on your solo CD, is a brilliant tune! Can you tell us a little about how you came up with it? A: I don’t write that many tunes, and the ones that I do are usually played in the kitchen at home and nowhere else! I’m glad that you like that tune though. I suppose that there are several ways of working (I’m sure that they’re similar for other people). a) Take an existing tune and play about with it. For example, take a G reel and play it in D (by which time you may have had to ‘adjust’ it to fit the range of the flute). Then try it as a jig (adding further ‘adjustments’), you’ll end up with a new tune, or at least one or two new phrases. (As an experiment : try playing ‘The Salamanca Reel’ in 6/8 …. it makes a great jig). b) Come up with a nice phrase and then build the tune around that. c) Play one of your favourite tunes over and over, then,instead of going into another recognizable tune just follow wherever your brain takes you. Often you’ll get a good starting phrase that way. This brings me to a good point : always keep a little tape player nearby, otherwise that brilliant phrase you just came up with will be gone for ever. I use a little dictation one that uses mini cassettes, I look upon it as a kind of notebook. As for ‘The Road to Buggleskelly’ : it took a while to write – unlike some tunes that just seem to write themselves (and which I usually fiddle with, not being satisfied with something that happens so quickly … but then I always end up returning to the original). I wrote the B part first a few years back, and then got the A part. I was never really happy with the A part, so I put it aside and then some months later, reworked it . It was written as a kind of “difficult” tune for accompanists ! Q: Speaking of recently written tunes, you mention that a book of Vincent Broderick’s flute tunes has been published in Ireland — do you know where one might one be able to obtain a copy? The Turoe Stone. Vincent Broderick. Published by Walton Music, Dublin. There’s also a tape to go with it called ‘The Turoe Stone’ produced by the Comhaltas. Q: If readers wanted to get copies of your solo CD, can you give us the names and addresses of distributors? A:It should be fairly easy to get through one of the specialist importers like ‘Elderly Instruments‘ or ‘The Celtic Trader’ in Charlotte N.C. It’s on ‘Pan’ Records, a Dutch label. Q: The 8-key flute you’re holding on the front cover of the CD looks like a Chris Wilkes Pratten replica (the keys look like Wilkes…but maybe it’s an actual Boosey or Pratten? ), and some of the other flutes on the back look like Rudalls — I don’t know about you, but I’ve always found it hard to switch from one to the other, and if you can offer any advice in that regard, particularly on how to get a good strong bottom D from a Rudall & Rose, it would be helpful. A: You have very good eyes! It’s my Hawkes concert flute. I have been told (and I pass this on as the result of a very erudite conversation one night in a pub in Cork) that it was probably made by Pratten. Hawkes later joined with Boosey to form Boosey and Hawkes and Pratten was associated with both companies. I like to think of it as an early Pratten’s Perfected. It’s unusually light. Patrick Olwell was taken by it and took measurements a number of years ago. I think that he may have used some of those in his own flutes because when I hold an Olwell flute it feels very strange, almost as if I had my own flute in my hands. I have an old Rudall Rose, but it’s not a great one. As I said earlier, I’ve been playing my own Hawkes for so long now, that it’s hard to immediately get a good sound out of another flute. So I don’t chop and change. I stay with the same flute. I’m afraid that I don’t know much about getting a good bottom D on a Rudall & Rose, unless it’s a problem of forcing the flute to play louder than was intended, with the result that some notes (towards the bottom) will sound a little thin.